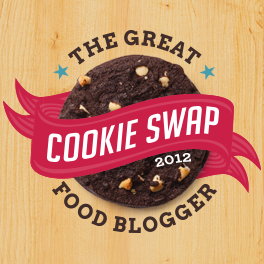 Today is a very special post because this year I signed up for the The Great Food Blogger Cookie Swap! Not only did I send out three dozen of these yummy cookies to three different bloggers, I received three dozen delicious different cookies from three different bloggers. And this cookie swap helped to benefit Cookies for Kids' Cancer! This was such a positive experience, the hardest part of deciding on a recipe to make! I didn't want to make cookies that went stale quickly or that would break in the shipping process (and I hope that these cookies did none of that!). I decided on these Heath Bits Peanut Butter Cookies, which I've been making the past several years. This recipe combines two of my favorite things, peanut butter cookies and toffee. This combines sweet and salty cookies with sweet and salty candies, so if you're into that flavor combination I think you would really love these cookies. Please see below who I sent cookies to and received cookies from this year as well as more yummy photos and the recipe! I will definitely be participating in this again next year! Beat shortening, peanut butter, brown sugar, milk and vanilla in large bowl until well blended. Add egg; beat just until blended. Combine flour, baking soda and salt; gradually beat into peanut butter mixture. Stir in 1 cup bits; reserve remainder for topping. Drop by heaping teaspoons about 2 inches (mine was 1 Tablespoon which was perfect) apart onto ungreased cookie sheet; top each with reserved bits. ooooh these cookies look big and chewy and full of amazing pb toffee flavor!! gorgeous photos! these sound seriously delicious! What lucky recipients! These are fabulous cookies for a really great cause! Definitely need to check out the other bloggers to see what delicious cookies you received. Fun event! These look like a great way to use of the toffee bits in my fridge... yum!